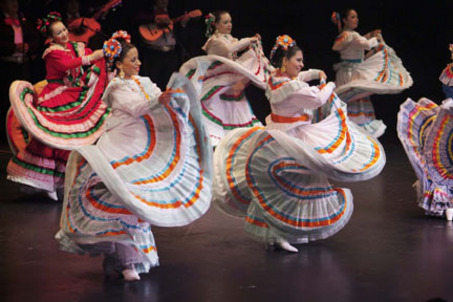 PACE University presents CALPULLI MEXICAN DANCE COMPANY | STREETS OF NEW YORK 411 INC.
Calpulli Mexican Dance Company brings its celebrated repertoire to the Schimmel. Calpulli will be unveiling its World Premiere of Dia de los Muertos(Day of the Dead), evoking the unending relationship between the living and the departed with music and dance as the language that transcends. Meticulous costuming, passionate live music, and larger than life surprises will have you mesmerized! In person in advance at The Michael Schimmel Center Box Office, open Mon-Fri from 1pm-6pm beginning August 27th. Day of Show at The Michael Schimmel Center starting two hours before curtain. Located one block east of City Hall and immediately adjacent to the Brooklyn Bridge, The Schimmel Center’s 670-seat theatre regularly hosts academic and community events in addition to its yearly schedule of the world’s finest music, theatre and dance. Over the past twelve years, The Schimmel Center has served as a founding venue for The River-to-River Festival (2002), hosted both The Tribeca Film Festival and The Tribeca Theatre Festival (2001), provided a headquarters for The National Actors Theatre (2002 to 2004), presented the only Democratic Presidential Debate to present all ten candidates for the 2004 election, and actively hosts James Lipton’s award-winning Bravo series Inside the Actors Studio, taped on the Schimmel Theatre’s stage since 2005. For more than 100 years, Pace University has helped prepare students to become leaders in their fields by providing an education that combines exceptional academics with professional experience. Pace has three campuses in New York City, Westchester and White Plains. A private metropolitan university, Pace enrolls approximately 13,500 students in bachelor’s, master’s, and doctoral programs in the Dyson College of Arts and Sciences, via its rapidly growing Performing Arts Department, Lienhard School of Nursing, Lubin School of Business, School of Education, Seidenberg School of Computer Science and Information Systems and School of Law. ← PACE University presents BELA FLECK, bluegrass banjo player.